Spatial Prepositions: In front / Inside / Behind is MITA’s advanced mental integration game, in which a child must combine various images within a grid. The game requires a child to notice the toy’s position and orientation, as well as the different colors and shapes of the various toys. The Combine Toys game also introduces a child to important elements of language: the spatial prepositions in front, behind, and inside. The easier levels of this game require the mental integration of a toy and a vehicle. A child must find the correct combination from the choices on the bottom of the screen and place it into the single empty cell within the grid. 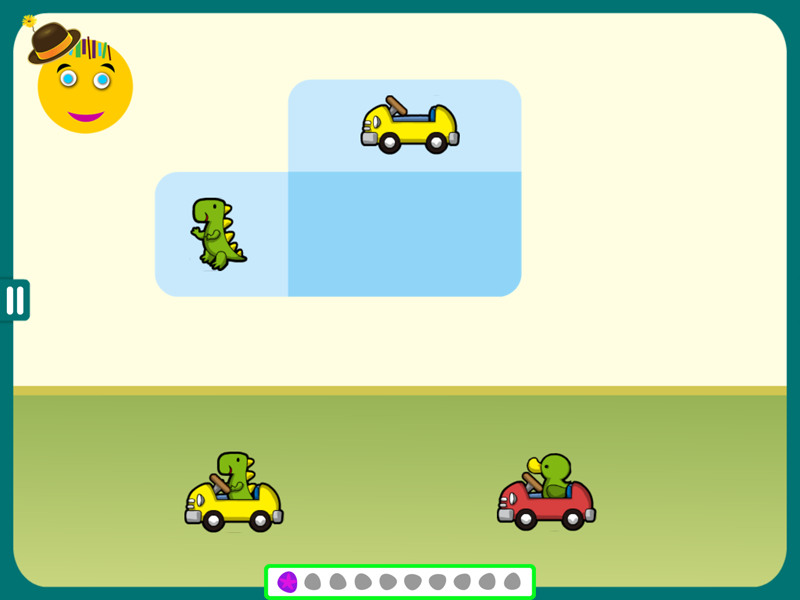 In the example below, a child must look at the grid and notice the toy (a dinosaur) as well as the color of the car (yellow), and then mentally combine these two objects, resulting in the correct answer (a green dinosaur inside a yellow car). 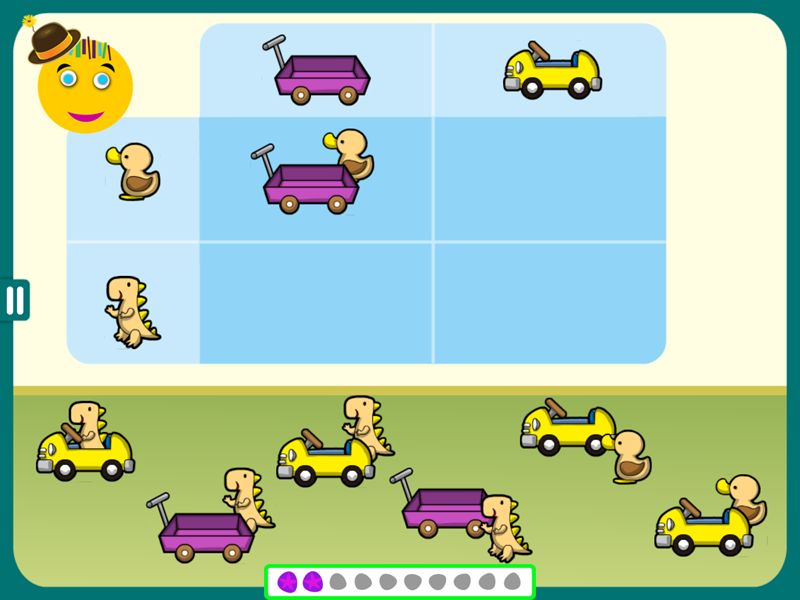 Eventually, the grid expands to have two empty cells and requires combining the toy with two different vehicles. In the example below, a child must notice the difference in vehicle orientation. Later on, the grid expands to have three empty cells and requires three combinations of toys. In the most difficult levels of this game, a child must notice not only the various features of all the toys and vehicles, but also the correct positioning of the toy, which is modeled in the top left cell of the grid. For example, in the puzzle below, the toy duck is placed behind the purple cart in the grid, indicating that all the toys in this puzzle must be placed behind the vehicle. 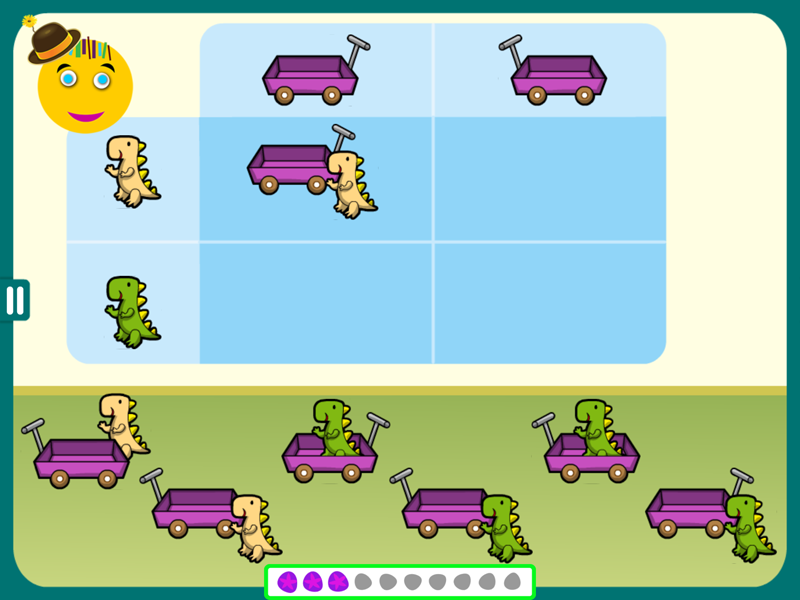 Below, the dinosaur must be placed behind the purple cart and a child will have to notice the positioning in order to choose the correct dinosaur-cart combination. 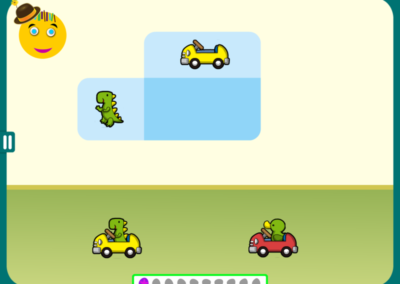 Level 40: Combine the objects in the grid, and make sure to notice the correct positioning (in this case, the toy should be placed behind the vehicle). As the game progresses, the toys on the left and the vehicles at the top of the grid become increasingly more similar, requiring a great deal of attention to multiple cues. 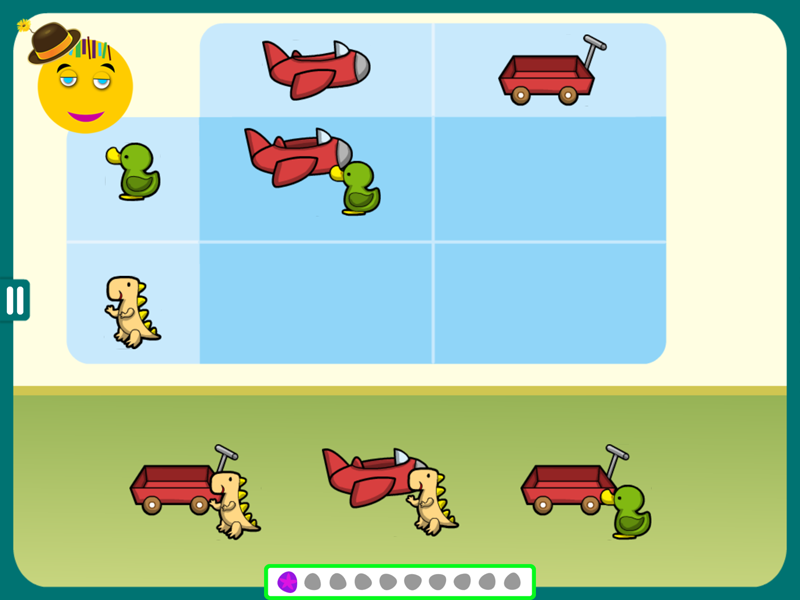 For example, in a puzzle from the final level of the game (level 50), a child will have to notice the color of the toy dinosaur (either green or tan) as well as the location of the cart’s handle (either on the left or on the right). In addition to that, a child will have to notice the positioning of the toys for this puzzle. The combination in the top left cell of the grid shows a dinosaur in front of the cart. This image indicates that, for this puzzle, all the correct combinations will have a dinosaur in front of the cart (as opposed to inside or behind the cart).